Road rehabilitation projects all have to meet the same requirements, regardless of where they are being carried out: they must be cost-effective, eco-friendly, and above all, finished quickly - because time is of the essence. Patchwork repairs are neither sustainable nor do they address the root cause. The W 380 CRi and W 240 CRi stand out thanks to their ease of operation with new automatic functions, main control panels that can be positioned as required, and an on-board diagnostic system. Wirtgen's tracked recyclers use the down-cut process when recycling. The cold recycling pioneer developed this process, in which the milling and mixing rotor rotates in sync, years ago. 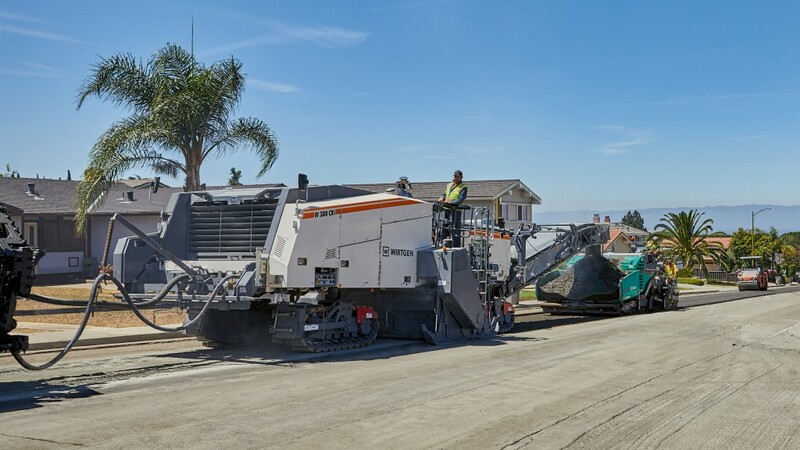 This method has become an essential part of day-to-day recycling operations, as it makes it possible to selectively vary the particle size of the material being processed - especially in the case of fragile, thin, old asphalt roads. Wirtgen cold recyclers can also be used as efficient, high-performance, large milling machines employing the up-cut process. Wirtgen recyclers can also feed granulate from upstream milling operations into the mixing process via the adjustable material guide system at the front of the machine. Another advantage of the cold recycling process that cannot be understated is the significant potential for energy savings during material processing. The raw materials do not have to be dried or heated, which means that 10-12 liters of fuel can be saved per ton compared to conventional rehabilitation methods. By almost completely reusing the surface course, the need to transport building materials can be reduced by up to 90%. At the same time, companies can cut resource consumption by 90% and completely eliminate the need to dispose of materials. This results in significantly reduced fuel consumption and lower CO2 emissions. Most importantly, the cold recycling design makes it possible to reduce the use of binders by up to 50% - the area with the greatest potential savings, since binders are still the biggest cost factor in road rehabilitation. Thanks to the special properties of BSM, cold recycling technology results in very low costs over the entire life of the roads. In addition to the W 380 CRi (775 kW; EU Stage 5 / US Tier 4f) and W 380 CR (708 kW; EU not regulated / US Tier 2) models, the new generation of Wirtgen recyclers also includes the W 240 CRi (775 KW; EU Stage 5 / US Tier 4f) and W 240 CR (708 KW; EU not regulated / US Tier 2). The W 240 CRi and W 240 CR recyclers can also be equipped with integrated Vögele AB 375 T variable screeds and have a maximum working width of 2,350 mm. The four cold recyclers can also be used as efficient, high-performance milling machines employing the traditional up-cut process. Thanks to powerful engines and an impressive conveyor belt capacity, they achieve high removal rates at a maximum milling depth of up to 350 mm - for instance when removing complete asphalt packages or for large-scale rehabilitation measures such as on motorways or airport runways.